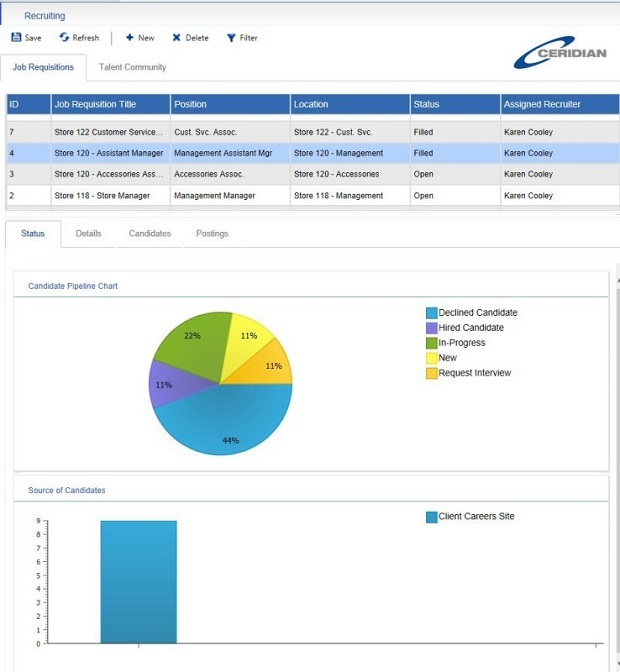 Ceridian Corp. has launched a new offering for recruiters and human resources managers, allowing them to identify their staffing needs, create job postings, find candidates, and get people hired. Branded as Dayforce Recruiting, the new offering is part of the Dayforce Human Capital Management (HCM) portfolio. It’s a software as a service, real-time application geared towards making it easier to on-board candidates and turn them into employees. All of their data gets kept in one record, rather than separated into a record as a candidate and a record as an employee – so when an employee wants to change jobs within the company, it becomes easier to offer options to them, as all of their data is in one spot. Other features include fast-tracking the application process, as job applications are linked to the positions advertised. Recruiters can also tailor their application forms to get the right data and responses for specific questions. 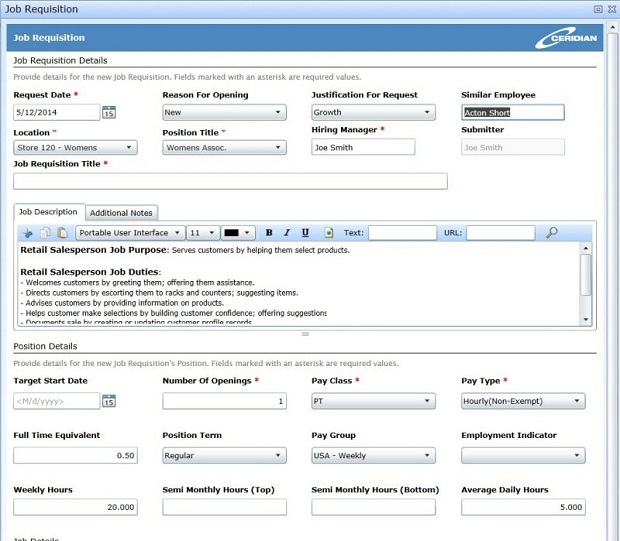 Job requisitions on Dayforce Recruiting. (Image: Ceridian). For hiring managers, they can treat candidates the way they would treat employees – with all of their records in one place, they can search through past applicants to see if they fit for other jobs. They also receive reports on which sources thus far have brought them the best employees. On the candidate’s side, job seekers can post jobs to their social networks via Dayforce Recruiting, so the word gets out among their circles about jobs that may interest their friends and followers. Dayforce has also streamlined the application process for them, making it easier for them to upload résumés and profile information straight from social media. They also get personal messages or automated messages, keeping them posted on what’s happening with the hiring process. Dayforce Recruiting reports for hiring managers. (Image: Ceridian). “In designing Dayforce Recruiting, special attention was given to the recruiter, hiring manager and candidate experiences, ensuring that each was flexible enough to capture information quickly and completely,” said Rob Rose, Ceridian’s vice-president of product management, in a statement. Based in Toronto, Dayforce was a workforce management software company until Ceridian acquired it in 2012.